A new (additional) direction at EWTN? Gregorian Chant: a Thing of the Future? SSPX: Formal schism or informal separation? This isn't liturgical, but since I am mentioning TCRnews and the social teachings of the Catholic Faith, I wanted to mention to those of you out there that IHS Press publishes a number of interesting works which pertain to the Distributist movement made especially famous by the likes of G.K. Chesterton and Hilaire Belloc. They are also printing other interesting works such as Belloc's critique of the media in The Free Press. I find the distributist movement interesting, particularly as it relates to a more monastic vision of life and culture, even as it pertains to the laity. The Church and the Land by Fr. Vincent McNabb, O.P. "...we both agreed EWTN is too lopsided toward the pedagogical at present and needs to seek the funds and ways to become a full Catholic based television network. A network in the sense of including, in addition to Mass and religious programming, a full schedule of wholesome shows, excellence in entertainment and movies (which need not be explicitly religious), music, comedy, documentaries, and news which represents the full spectrum of Catholic and ecumenical thought in an objective fashion as it surveys the great issues and events of our day." At first, when I read this my reaction was a defensive one, knowing the incredibly good work that EWTN does. However, upon thinking about the basic premise, I realized that they are onto something here. I'd like to contribute my own voice to the discussion. I believe this is a good idea because Catholic families need viable alternatives to mainstream television programming which is, at best, a mixture of acceptable and morally offensive programming. That mixture is a problem. I can envision a line-up which includes programs specifically created for a Catholic audience on the one hand; perhaps a comedy, for example, set in a parish setting, but unlike programs like "Father Ted" which make priests look like drunks, bumbling fools, etc. However, in addition to this kind of specialized programming, I can also see the inclusion of programs which aren't specifically Catholic, but which fall into the corpus of Western literary classics. For example, BBC produced dramas such as "Horatio Hornblower", or others which put classic novels to film would be a wonderful bit of programming on such a channel. This also has a practical dimension to it as expecting one small network to come up with an entire slate of original shows is simply too much to ask. Eventually, if this ever really got going, wouldn't it be wonderful to see Catholic classics like Chesterton's "The Man who was Thursday" put to a BBC like production? Or a weekly mystery series which uses the Father Brown mysteries (or Dr. Ralph McInerny's spin on that as well) as its basis. All this being said, EWTN presently provides a much needed service. For many Catholics, the catechetical and liturgical programming they currently receive there is their only contact with genuine Catholic liturgy and catechesis in the vacuum that is the present Latin rite parish. Because of that, I think it would not be a good idea to lessen this, at least not substantially. This is the centre from which all else flows. To that end, I think the ideal would be the creation of "EWTN 1" and "EWTN 2" much like "BBC 1/2/3". EWTN 1 could thus be maintained as it is, and "EWTN 2" could orient itself more as a general programming alternative for comedies, dramas, mysteries, documentaries, kids programs in the vein of public television, but with a distinctively Catholic twist. Now, this is all fine and good, but this is easy to say and not so easy to do, as it takes time, money and resources which may not at present exist. The idea is worth floating out there however. Vatican, Dec. 30 (CWNews.com) - Pope Benedict XVI stressed the importance of liturgical music, saying that "sacred music is a ministerial function in the divine service," as he met on December 30 with young choir members. The Holy Father spoke to about 4,500 members of Pueri Cantores, representing more than 90 youth choirs from all around the world, who were attending an international gathering in Rome. Addressing them in French, the Pope said that Vatican II had emphasized "how greatly the Church appreciates the role of those who, with their singing, contribute to the beauty of the liturgy." Founded in 1965 to encourage choirs composed of schoolchildren, Pueri Cantores brought together large groups of young people from Germany, Belgium, France, Italy, and the United States for its 33 international congress. Other sizeable delegations came from countries as diverse as Gabon, Congo, Spain, Poland, Estonia, and Russia. When he arrived in the Paul VI auditorium to address the group, Pope Benedict was greeted with the song, Tu es Petrus ("You Are Peter"). He praised the group for its "service of the liturgy, giving the entire world a message of peace and brotherhood." ROMA, December 27, 2005 – In his powerful pre-Christmas address to the curia, Benedict XVI dedicated a passage to the synod of bishops on the Eucharist, which was held in the Vatican last October. He recalled that this revival of Eucharistic adoration was also displayed during World Youth Day last August in Cologne. This tendency has left its mark on how the liturgy is celebrated in many places. And it still finds significant proponents. Both of these bishops gave as an example to be followed the way in which the Mass is celebrated among the Neocatechumenals. And in fact, among the new movements that have arisen in the Catholic Church, the Neocatechumenal Way is the one that goes the farthest in introducing innovations to the celebration of the Mass. In the Neocatechumenal Way, communion is taken while seated around a large square table, with a large loaf of bread that is divided among the participants and wine that is passes from hand to hand and is taken in large swallows. But communion is not the only area in which there is a departure from the traditional liturgy. There are significant innovations in other parts of the Mass. For example, the readings from the liturgy of the Word are commented upon by the catechists of the group, who make lengthy “admonitions” followed by “resonances” from many of those present. The priest’s homily is hardly distinguished, or not distinguished at all, from the rest of the comments. The times and places for the Mass are also unusual. The Neocatechumenals do not celebrate their Masses on Sunday, but on Saturday evening, in small groups and separate from the parish communities to which they belong. Each Neocatechumenal group corresponds to a different stage of the Way, so each group of 20-30 persons has its own Mass. If there are ten groups of Neocatechumenals in a parish, there will be ten different Masses on Saturday evening, in ten separate locations. The statutes approved by the Holy See in 2002 require that the Masses of the Neocatechumenals be “open to other members of the faithful” (article 13.3), but in fact nothing has changed. The greetings, presentations, and applause during the entrance ceremony form a natural barrier to outsiders. Benedict XVI has written the last word on all of this. In mid-December, the founders and directors of the Neocatechumenal Way – Spaniards Kiko Argüello and Carmen Hernandez, and the Italian priest Mario Pezzi – received a two-page letter from cardinal Francis Arinze, prefect of the Congregation for Divine Worship and the Discipline of the Sacraments, with a list of “decisions of the Holy Father” which they must obey. The letter is reproduced down below. Of the six points detailing the pope’s directives, only one permits the Neocatechumenals to continue what they are doing. This regards placing the exchange of peace before the offertory, a traditional practice in the Christian liturgy which is still in use today, for example, in the Ambrosian Rite celebrated in the archdiocese of Milan. All the other points require the Neocatechumenal Way to eliminate a large portion of its liturgical innovations. Until recently, the founders and directors of the Way had shielded these practices by claiming they had received verbal authorization from John Paul II. But with Benedict XVI, playtime is over. And it’s coming to an end for the liturgical abuses practiced throughout the Church. In this regard, pope Joseph Ratzinger’s document in conclusion of the synod of the Eucharist will be of great interest. "I am to inform you of the Holy Father’s decisions..."
Following the conversations with this Congregation for Divine Worship and the Discipline of the Sacraments on the celebration of the Most Holy Eucharist in the communities of the Neocatechumenal Way, in keeping with the guidelines issued in the meeting with you on November 11 of this year, I am to inform you of the Holy Father’s decisions. 1. Sunday is the “Dies Domini” as the Servant of God Pope John Paul II wished to illustrate in the Apostolic Letter on the Lord’s Day. Therefore the Neocatechumenal Way must enter into dialogue with the diocesan bishop in order to make it clear that the community of the Neocatechumenal Way is incorporated into the parish even in the context of the liturgical celebrations. At least one Sunday per month, the communities of the Neocatechumenal Way must participate in the Holy Mass of the parish community. 2. As for any admonitions issued before the readings, these must be brief. Adherence must also be shown to what is set out in the “Institutio Generalis Missalis Romani” (nn. 105 and 128) and to the Praenotanda of the “Ordo Lectionum Missae” (nn. 15, 19, 38, 42). Careful attention must also be paid to the Instruction “Redemptionis Sacramentum,” no. 74. 4. On the exchange of peace, permission is granted to the Neocatechumenal Way to continue using the indult already granted, pending further instructions. 5. On the manner of receiving Holy Communion, a period of transition (not exceeding two years) is granted to the Neocatechumenal Way to pass from the widespread manner of receiving Holy Communion in its communities (seated, with a cloth-covered table placed at the center of the church instead of the dedicated altar in the sanctuary) to the normal way in which the entire Church receives Holy Communion. This means that the Neocatechumenal Way must begin to adopt the manner of distributing the Body and Blood of Christ that is provided in the liturgical books. 6. The Neocatechumenal Way must also make use of the other Eucharistic Prayers contained in the missal, and not only Eucharistic Prayer II. In short, the Neocatechumenal Way, in its celebration of the Holy Mass, should follow the approved liturgical books, keeping in mind what is laid out above under the numbers 1,2,3,4,5, and 6. Acknowledging the favors that the Lord has bestowed upon the Church through the many activities of the Neocatechumenal Way, I take this occasion to extend to you my best regards. For those new to this weblog and whom haven't noticed it on the sidebar, I just want to draw your attention to our used Catholic books section. Many people have been purchasing some great Catholic books out of there. Thanks to everyone who has been doing so. I also wanted to let those who have already been looking at these books know that there are many more titles available on here than those listed. I particularly wanted to note that I have a number of spiritual classics, books by Pere Raoul Plus, SJ, Garrigou-Langrange, writings of the Saints, Dom Hubert von Zeller, Dietrich von Hildebrand, Hans Urs von Balthasaar, Romano Guardini, etc. I also have a good selection of Carmelite materials, not only the spiritual classics of St. John of the Cross and St. Teresa of Avila (in old hardcover editions) but also books about them, or on the Little Flower. Finally, I am thinking of some other Catholic titles I have which I'm going to sell "by the box" for discounted prices. Books, for example, on (not by) the saints, on the BVM, or about the Popes, etc. If there is anyone interested in this, please let me know the subject area and I can let you know what I might have available as part of such a deal. I can't put everything up at once, but I can direct things which may be of more interest. Please email me if you're interested in anything like this. This is a model of the schematic design proposed by the firm of HDB/Cram & Ferguson, the successor to Gothic revivalist extraordinaire Ralph Adams Cram, for a new church for St. Charles Borromeo Parish in Hampshire, Illinois. When completed in 2008, it will be one of the first truly monumental church projects (1000 seats) of the incipient revival (along with Clear Creek Monastery and the TAC chapel), and the first one to be Gothic. This is the same firm, incidentally, behind the lovely new 200-seat parish church of Our Lady of Walsingham down in Texas. While I have not had the chance to work in-depth in the Gothic manner, I certainly love the verticality of Gothic churches and find HDB/Cram & Ferguson's contributions to the renewal of Christian architecture very heartening. More please! (Cross-posted to the Shrine of the Holy Whapping). Over at the Shrine of the Holy Whapping, I've got a post on the Tridentine customs connected with St. John's day, including a translation of the traditional blessing for wine associated with today's feast. Enjoy! It is during the Mass that the priest invokes the Holy Spirit to transform ordinary bread and wine into the body and blood of Christ. The outward appearances, the accidents, of bread and wine remain the same, but the substance has been transubstantiated. It is through the holy Eucharist, the fruit of the Mass, that mankind continues to share in the divine life opened up for him by Jesus' incarnation and paschal mystery. The relationship between the Incarnation and the Mass is most closely seen in one's faith in Jesus the God-man and in one's faith in Jesus the Bread of Life. Stumbling blocks to one dogma are usually of a kind with stumbling blocks to the other. At the end of the day, it is a matter of faith. Faith is most beautifully expressed at Mass when the faithful give the assent of faith with their "amens" after the Creed and reception of the Eucharist. It is at the Mass that we stand within the new Jerusalem, what St. Augustine calls "the city of God," to realize the words of the heavenly voice recorded by St. John: "Behold, the dwelling of God is with men. He will dwell with them, and they shall be his people, and God himself will be with them" (Revelation 21:3). At no point in time is God closer to his people than in the Eucharistic sacrifice. It is the eyes of faith that see the God-man in Jesus and Jesus in the Blessed Sacrament. Jesus' divinity did not prevent his physical degradation during his passion, as the Real Presence does not prevent desecration of the species or misunderstandings about the Mass. Just as there is great difficulty in accepting the incarnation, so there is great difficulty in accepting that the consecrated Host is Jesus' body, blood, soul and divinity. The Real Presence of Jesus in the Eucharist, like the incarnation, is a profound and mysterious truth of faith. And, like the Incarnation, it has had its share of detractors. The 16th century was the watershed for Eucharistic heresies. Whether the consubstantiation offered by Martin Luther or the various forms of symbolism offered by Ulrich Zwingli, John Calvin and others, this period marks a significant departure of many Christians from the Church's traditional Eucharistic theology articulated at the Council of Trent. However, the 16th century was hardly the beginning -­ and hardly the end -­ of doubts about the Eucharist. One of the earliest and most acute is the lack of faith among some of Jesus' first disciples. St. John reports that Jesus said, "Truly, truly I say to you, unless you eat the flesh of the Son of Man and drink his blood, you have no life in you" (John 6:53). The statement caused unrest among Jesus' disciples who said, "This is a hard saying; who can listen to it?" (6:60). And, even after much explanation on the part of the Lord, St. John reports: "After this many of his disciples drew back and no longer went about with him" (6:66). To be sure, it is a hard saying, and many have drawn back and no longer go about with Jesus because of it. As with the Incarnation, the difficulty is rooted in the earthliness, the fleshiness, if you will, of the matter. It is no easy thing to accept a God who comes so close, a God who makes his very self real food and real drink for his creatures. But that is the very thing that Jesus did at the Last Supper. The accounts of the Last Supper in the synoptic gospels (Matthew 26:26-29; Mark 14:22-25; Luke 22:14-20) point to Jesus' special wish to celebrate it with his disciples and to have his disciples celebrate it thereafter. In Matthew, Jesus is emphatic that what they eat is his body and what they drink is his blood, which is poured out for the forgiveness of sins. In Mark, Jesus is emphatic that what they eat is his body and what they drink is his blood, which is poured out for many. In Luke, Jesus is emphatic that what they eat is his body and what they drink is his blood, and that they should continue to do so in remembrance of him. 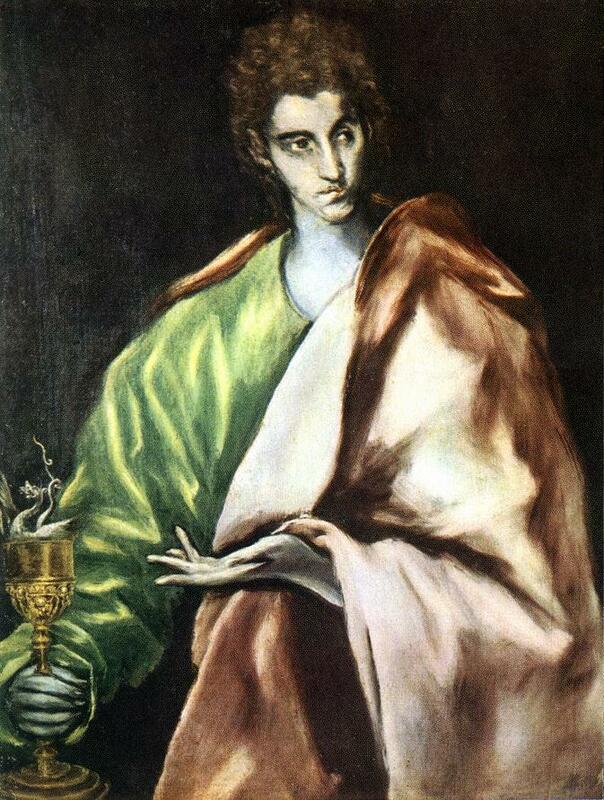 The same scenario is recorded by St. Paul as a rite which he passed on to the Corinthians (1 Corinthians 11:23-26). And St. John, though he does not record the words of institution but the washing of the feet at the Last Supper (13:1-20), renders more Eucharistic references throughout his Gospel than any of the synoptics. It is clear from Sacred Scripture that Jesus intended to inaugurate the sacrament of the Eucharist at the Last Supper in such wise that it be carried out continually thereafter by his disciples. And that is exactly what St. Paul, like so many others in the early Church, was doing when he brought the Mass to Corinth. The Mass is Jesus' greatest legacy to the Church. It is in the Mass that we eat the bread and drink the cup and, thereby, "proclaim the Lord's death until he comes" (1 Corinthians 11:26). Within the analogy of faith, we see how important it is to relate the Incarnation with the Eucharist, the two "moments" when God becomes so close to us by becoming one of us and by giving himself to us for food under the guise of bread and wine. It is surely no accident that a tradition arose in the Middle Ages for the priest to read John 1:1-18 at the end of Mass as an act of private devotion. Pope St. Pius V incorporated the verses into his Missale Romanum (1570), where they became known as the "Last Gospel." Praying for a deeper understanding of the incarnation and the Mass brings us closer to Jesus, the Word made flesh, from whose "fullness have we all received, grace upon grace" (John 1:16). VATICAN CITY, DEC. 24, 2005 (ZENIT.org).- Gregorian chant has been unjustly abandoned and its place in the life of the Church should be recovered, says a Vatican aide. Monsignor Valenti Miserachs Grau made this declaration at a recent encounter organized by the Congregation for Divine Worship and the Sacraments at the Vatican. Monsignor Miserachs has been president of the Pontifical Institute of Sacred Music since 1995. This Spanish musician, who has composed more than 2,000 pieces, is also the canonical chapel director of the Basilica of St. Mary Major in Rome. ZENIT interviewed him about the state of Gregorian chant. Q: On a day in the Vatican dedicated to chant you have asked that Gregorian chant be recovered and the proposal was well applauded. Does this mean that there is a consensus on its recovery? Monsignor Miserachs: I believe that this means that there is a general opinion that coincides on the necessity of recovering Latin and Gregorian chant, which is the chant proper to the Church. Gregorian chant has been abandoned and left to concert halls and CD's when its proper place was and is the liturgy. Q: In the 21st century, does it seem logical to you that Church music be not exclusively Gregorian chant? Monsignor Miserachs: I think that new musical products, in the majority of cases, have not learned or have not been able to root themselves in the tradition of the Church, thus dragging in a general impoverishment. It is incomprehensible, especially in the Latin countries, that Latin and Gregorian chant has been pushed aside in the last 40 years. Forgetting Gregorian has created the conditions for the proliferation of new musical products that sometimes don't have sufficient technical quality. Those that do have it can be used along with Gregorian, why not? Q: Why is the capacity of the faithful to learn Latin melodies not appreciated? Monsignor Miserachs: It was thought that they were incapable, but this was wrong. Before, people knew how to sing the basic songs in Latin. Today, it seems that efforts are being made to make them unlearn what they knew. It is obvious that we cannot propose they learn the entire repertoire, which contains 5,000 pieces. In liturgical chant the assembly does not have to be the only protagonist. A certain order must be kept. The people should sing their part and the rest should be done by the choir, the chanter, the psalmist and obviously the celebrant. To launch Gregorian chant in the assembly again, we could begin remembering the Pater Noster, the Kyrie, the Sanctus and the Agnus Dei. If they were invited, given the music and then properly trained, the people would be completely capable of following and singing easy Gregorian melodies, even if it were the first time they heard them. Just as the repertoire of Gregorian chant is learned, so also other songs in living languages can be learned. I obviously am referring to those that are worthy of being beside the Gregorian repertoire. Q: Is sufficient attention given to the question of sacred music in the Church? Monsignor Miserachs: No. For some time, we have insisted on this point. Our institute does its job, but it is only an academic institution, not a normative body and it thus has no say in these affairs. A Vatican body is needed that would directly oversee the matters of sacred music. John Paul II stated that the musical aspect of liturgical celebrations cannot be left to improvisation or to the free will of the people. It should be confided to a concerted direction and the respect for certain norms. Authorized indications are awaited and this concerns the Church of Rome, the Holy See. A merry Christ Mass to you all, and thanks for your prayers during this election campaign. It has been so intense that it will be nice to have a week off to spend with family. As I do every year, I wrote a Christ Mass essay. This year's essay is a tribute to a Catholic gentleman named Raymond. It borrows its title from an old New Covenant article called The Gifts Not Under the Tree. An article has appeared in this month's edition of Inside the Vatican magazine, which details the spirituality and history of the Institute of Christ the King in the United States. For the PDF version of this article, complete with beautiful colour photographs, click here. For the text only version, click here. The U.S. Catholic radio network Relevant Radio will be providing live transmission of the Christmas Midnight Mass, celebrated in the classical Roman liturgy, from St. Joseph’s Oratory, the Institute of Christ the King’s apostolate in Green Bay, Wisconsin. This month's edition of the Adoremus Bulletin has "a transcript of the US bishops’ discussion on the latest draft translation of the Order of Mass. This discussion took place on Monday afternoon, November 14, 2005, during the USCCB meeting held in Washington." "Liturgiam authenticam says if the text is inadequate you should change it anyway, even if you might have to deal with a pastoral problem. On the other hand, those who were quite willing to say even every generation should have a new translation -- because language is living, so keep it changing -- are now saying: Well, because the people have the habit of saying it this way, don’t disturb them and don’t change them. Both those are rather weighty arguments. There’s an irony inasmuch as positions seem to have shifted." The document is very revealing and potentially shows forth some of the ideological positions that may be present on the part of the BCL (Bishops Committee on the Liturgy). Fortunately, we see some bishops calling this to task, and asking why certain recommendations for the status quo (ie. the previous ICEL translation) are put forward when only an extreme minority of the bishops saw this as any concern. Bishop Vigneron claimed: "There are thirteen occasions when our Committee is recommending to ICEL keeping the 1970 texts when no one wrote to the Committee to say there was a problem with that text. And I find that very problematic." Likewise, there are some intriguing discussions about Liturgiam Authenticam and its role in all this. "The principle that the people’s parts should not be disturbed presupposes that you have an adequate translation. In the case of a number of people’s parts right now the translation is not adequate. It isn’t always doctrinally wrong, but that isn’t the only criterion, that isn’t the major criterion in Liturgiam authenticam, as such. The other two points I would like to make is that when we approved the translation of the second edition, which has never been received [approved] by the Holy See and therefore is not official, we did change the people’s parts. And this concern wasn’t so evident at that time." "I think the fact that we’re going to have these texts for a long period of time, as you indicated, makes me less receptive to the argument that it would be upsetting for people who have gotten used to these texts over the last 30 or 35 years. Thirty-five years ago we changed texts that had been in use for four hundred years. Now, that upset many people, but we did that for strong reasons. And I think we shouldn’t say: “Well, we’re not going to do it now because that will upset people”. If we have defective translations, or translations that could be improved, I think we should do that now. Sort of bite the bullet. Get it done, and get it done right. And so we can live with that for a long period of time." Archbishop Chaput noted in defense of changes to the text: "I’d like to propose that changing the texts is a great moment for re-education of all of us in liturgy. To actually read the texts, rather than to recite them out of rote memory can be a very good re-educational process for all of us in the Church. So I certainly favor having correct texts, even if it means changing them. So that would be my position. But I think it can help us come to a deeper understanding of what we say when we pray together at the liturgy. And it isn’t always a bad thing. And I think that we should do it once and for all, rather than piece by piece. So I don’t think the suggestions that have been made by ICEL for significant change would hurt the Church, but would help the Church." To read the complete text, and I highly recommend this, click here. One of our readers was kind enough to send a link to recent pictures posted from St. Mary's in South Carolina for the feast of Christ the King. VATICAN CITY, DEC. 22, 2005 (Zenit.org).- The crisis that arose in the Church after the Second Vatican Council wasn't due to the conciliar documents, but rather in their interpretation, says Benedict XVI. The Pope made a long analysis of the legacy left by the 1962-1965 gathering of the world's bishops, when he met today with his aides in the Roman Curia to express his Christmas greetings. The Holy Father asked rhetorically: "What has been good and what has been insufficient or mistaken?" in the implementation of the Council. According to Benedict XVI, the reception of the Council's messages took place according to two interpretations that "confronted each other and have had disputes between them." The first interpretation is the one the Pope called "hermeneutics of discontinuity and rupture" "between the pre-conciliar and post-conciliar Church." According to this view, what is important about the Council is not its texts but the spirit of renewal brought to the Church, the Holy Father said. This view, he observed, "has often been able to make use of the media's liking, and also of a part of modern theology." The other interpretation is "the hermeneutics of reform," which was proposed by the Popes who opened and closed the Council, John XXIII and Paul VI, and which is bearing fruits "in a silent but ever more visible way," said Benedict XVI. According to this view, the objective of the Council and of every reform in the Church is "to transmit the doctrine purely and fully, without diminutions or distortions," conscious that "our duty not only consists in guarding this precious treasure, as though we were concerned only with antiquity, but in dedicating ourselves with a firm will and without fear to the work that our age calls for," the Pope said. "One thing is the deposit of faith, that is, the truths contained in our venerated doctrine, and another [is] the way in which they are enunciated, preserving however the same meaning and fullness," he said, echoing John XXIII. In this way, the Council presented a "new definition of the relationship between the faith of the Church and some essential elements of modern thought," Benedict XVI pointed out. He insisted that "the Church, both before as well as after the Council, is the same one, holy, catholic and apostolic Church, journeying through time." "Today we can look back with gratitude to the Second Vatican Council," he added. "If we read and receive it, guided by an appropriate hermeneutic, it can be and will be increasingly a great force for the always necessary renewal of the Church." VATICAN CITY (CNS) -- Pope Benedict XVI told the boys in the Sistine Chapel choir that he knows how much they sacrifice to be part of the choir, but he said the result of their hard work is an angelic gift to others. Pope Benedict officially was the only member of the audience Dec. 20 when the Sistine Chapel choir -- made up of 20 adult men and 35 boys ages 11-13 -- performed in the Sistine Chapel. While the Vatican billed the concert as "strictly private," its press office Dec. 21 released a transcript of the pope's remarks to the choir. He began with an apology, saying: "I could not find the time to prepare a speech, even though my idea was very simple -- to say in these days right before Christmas that these are days to give thanks for gifts." A translation of this speech to English would be enormously valuable, for the press reports that Benedict XVI spoke about the beauty of Gregorian Chant. Can someone post a translation to the comments section of this blog or email one to me? Catholics of a traditional bent have not failed to notice that His Holiness, Pope Benedict XVI has restored the usage of some papal attire that hasn't seen use for some decades now. This includes the "mozzetta" which is the velvet, ermine lined piece in this picture, and more recently today, the similiar cap (camauro) which has been worn by popes since the middle ages. It is nice to see such traditions renewed, much like the older style pallium that Pope Benedict wore for his coronation. One wonders if we shall be so blessed to see the papal slippers return? It's hard not to look at the old Liturgical Movement of the '20s and '30s as we contemplate the Reform of the Reform. Much good was acomplished by noble-minded men like Pius Parsch, J.B. O'Connell, and Dom Roulin. But to characterize it as a golden age would be just as wrong as to characterize the eve-of-the-Council 1950s or the emigrant world of nineteenth-century American Catholicism as equally flawless. Each had their strengths and their flaws; in the case of the Liturgical Movement, there were some very great strengths and some frustrating flaws. I will be focusing on the flaws below--which is difficult, given the great admiration I possess for the good they accomplished. A browse through any edition of Liturgical Arts Quarterly from its foundation in the '30s to its demise in the 1960s confirms this mixture of good and bad: articles on noble Gothic churches stand next to ugly, squat "liturgical" baptismal fonts and paens to the versus populum atar. The schitzophrenia one finds even in such classic works as J.B. O'Connell's Church Building and Furnishing: The Church's Way is baffling. After sage warnings against "coarse or barbaric" modernistic art, as well as a lengthy section on the importance of the veiled tabernacle as a sign of reverence to the reserved Sacrament, the reader finds himself contemplating a photo of a hideous plain box--completely unveiled--under a preposterous minimalist ciborium installed in some Gothic church in Trier. The Liturgical Movement produced the glorious blueprint of Sacrosanctum Concilium but it also is in part to blame for opening the door to kitsch-hip monstrosities like Le Corbusier's chapel at Ronchamp. The nourishing spirit of the early twentieth-century Liturgical Movement should inspire us as we go forward to re-enchant our experience of the Mass with the gilding of Tradition, but we shouldn't be blind to its flaws. The stylistic diversity--Gothic, Romanesque, even some of the modern--one finds in their work is in itself not bad. The problem is not that some of the Movement's supporters made peace with Modern art, but a tendency to opt for a priori logic and a deeper misunderstanding of the nature of the Church's many traditions one finds in their writings. In a sense, they were incapable of leaving well enough alone. Everything in their writings is subjected to some sort of interrogation. Everything must be perfectly crystal-clear from the get-go. I'm reminded of a passage in one of the texts of the time where the author excoriates, in a remarkably unnecessary footnote, those who cross themselves with holy water upon exiting the church after mass because, having come from the Holy Sacrifice, there's no theological rationale for further cleansing. This quibble illustrates the heart of the problem. On the surface, the author is largely in the right, and he is right to demand a certain theological correctness in our devotional practice--but there's a certain sharp-edged naivete at work here. It's easy to stop old devotional habits, hard to inculcate new ones. Furthermore, as fallen human beings, we need all the sacramentals and grace we can get. People are tempted at Mass just like anywhere else--tempted to doubt, to uncharity, and a million other things as your mind wanders. While some pious customs of the last century lurched towards excess and beared reform, that the author had nothing better to do than chastise old church ladies dipping their fingers in the font strikes me as weirdly petty. Occasionally, strategic apathy is not so bad: Leave well enough alone. 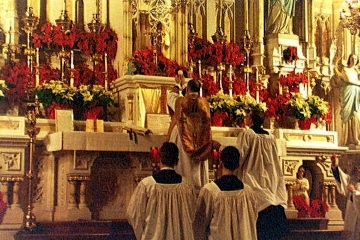 In many cases, the propositions the Liturgical Movement set forth regarding the altar are quite laudable: 1) a desire for liturgical correctness in the form of a veiled tabernacle and a canopy--both required by liturgical law; 2) an emphasis on the sacrificial character of the altar; 3) that the altar be fixed and permanent in accordance with church law; 4) it should not be too encumbered with superfluous additions; and 5) it should be visually striking and its significance easily grasped. The problem is, many liturgists of the period seemed to think these ideals required sacrificing complex beauty, grand reredoses and other visual foci, as well as downplaying the cultus of the reserved Sacrament. The false dichotomy is omnipresent in such texts as O'Connell's, and sadly colors much of his commentary. For instance, O'Connell refers to the ages of the altar's development in ecclesiastical architecture under the nearly sarcastic headings of "the relic age" (the ninth to the fourteenth century, when reliquaries first encumbered the altar), "the Great Reredos Age," the nineteenth-century "Exposition Age" (in reference to the presumed ubiquity of Benediction) and the present day. His desires are praiseworthy, to make sure the altar is seen as the stone of sacrifice, the place where heaven and earth meet in the Mass. But for some reason, he is gripped by a strange notion many liturgists hold today, that the people are incapable of holding two ideas in their head at once, that making the reredos and tabernacle a grand home for the Eucharist will somehow overwhelm the sacrificial nature of the altar. It's my own experience that I seldom think of the tabernacle at Mass. For one thing, no matter which way the priest is facing, he's usually blocking my view of it. We would probably have never worried about the purported conflict between the reserved Eucharist and the "active" Eucharist on the altar unless some busybody liturgist had pointed it out. Maybe it did distract people; I wasn't alive then. But somehow I doubt it. Looking at the problem with hindsight, any action which lessens the dignity of the Eucharist, whatever the motive, is a supremely bad idea. The decline in belief in the Real Presence among Catholics was not helped by the lessening of ceremonial attention paid to Christ present in the tabernacle, and especially by its removal from the altar. Admitted, it is the altar, we are correctly reminded, not the tabernacle, that is the most important piece of furniture in a church, but the tabernacle contains a Person of universal importance. Leave well enough alone, once again. The reserved Eucharist may have been originally kept only for Viaticum, but it would be a heartless archaeologism that denies the importance of Eucharistic worship and pious adoration. The mania for the uncluttered altar resulted in many unfortunate architectural choices; indeed, it resulted, unintentionally, in a diminution of the altar's dignity. O'Connell and others looked to church law and found the freestanding altar--used ad orientemin most cases--to be most correct, liturgically. They were right to say so; but there was a good reason in terms of praxis and custom that it had largely been abandoned by that time period, and without Rome shedding too many tears. Church law has always been interpreted by custom, and at the time those regulations were being written down, at the high water mark of the Tridentine age, the Church had a place for both freestanding and wall altars, as one can see from any visit to Rome. A freestanding altar, even under a ciborium, is strangely naked, even when vested. The much-maligned reredos serves to give it stature and dignity. Rather than calling it a sideboard for flower arrangements, one might think of the wall altar as like a much-venerated statue of the Virgin armored head-to-toe with ex-votos and embroidered vestments. With the tabernacle in place at the center, we no longer are faced with the problem of conflicting visual foci. The faithful needn't be distracted by a tabernacle off on one side and the altar in the center, an arrangement much more distracting and detrimental than the supposedly troublesome situation it replaced. Ironically, in many churches that were "corrected" by pulling the altar out from the wall, the reredos is even more intrusive now that it's essentially little more than a backdrop for sacramental action. The reformers were correct to remind us of more ancient models like the freestanding altar, that the Tridentine triumirate of altar, tabernacle and reredos had not always been there, but they were wrong to demand fealty to only their favorite models rather than embracing the best of the past and (their) present. Laws must be interpreted in context of custom, and with a view towards pastoral needs. It is easy to blame the men of the Movement knowing what we do now, but we mustn't let their mistakes overshadow their many legitimate glories. But let us not forget the one principle they neglected, that sometimes one really ought to leave well enough alone. Vatican, Dec. 21 (CWNews.com) - Pope Benedict XVI today said that papal ceremonies "must be exemplary liturgy for the entire world." The Pope was speaking to choir of the pontifical chapel, led by director Giuseppe Liberto, after a concert in the Sistine Chapel. Speaking extemporaneously, the Pope spoke about the importance of liturgical music. The importance of pontifical liturgy has become more pronounced, the Pope said. He noted that "today, with television and radio, many people, from all parts of the world, follow the liturgy." Those who follow the papal ceremonies are likely to use them as a yardstick against which liturgy should be measured, the Pope said. Thus the liturgy becomes a way in which the Pope teaches the Catholic faithful, giving them a proper idea of what they should expect. The Pope underlined the importance of beauty in liturgical celebrations. He observed that the beauty of music -- especially chant -- can enhance the experience of worship. And he added that doing something beautiful for God has its own merit -- observing that the site of his talk, the Sistine Chapel, was an outstanding example of a work of great artistic beauty devoted to religious faith. Gregorian chant has a special place in liturgical music, the Holy Father continued. He reminded his listeners that the tradition of the Church has always suggested that angels chant rather than merely speaking, and that the beauty of their chant is "a celestial beauty, revealing the beauty of heaven." The chant performed by human singers provides an echo of that "angelic chant," the Pope continued. He thanked the young singers for the contributions that they make to the beauty of papal liturgies, acknowledging the sacrificies they make in order to do so. Pope Benedict has always shown a keen interest in liturgical renewal and liturgical music. His 1999 book The Spirit of the Liturgy devoted a full chapter to liturgical music. I happened upon some absolutely incredible pictures from the Institute of Christ the King. This is one beautiful oratory, and the liturgy looks simply heavenly. Pictures available here. Click to enlarge. Picture copyright Matthew Alderman. This fall, our studio project for the School of Architecture was to design a 500-700-seat parish church for a site at 1500 South Michigan Avenue, Chicago, a lot currently occupied by the 1997 Old St. Mary's Church, a ministry of the Paulist Fathers originally founded in 1833. Old St. Mary's was begun shortly before the housing boom in the area led to a massive upsurge in gentrification. Land prices have shot up and a large number of urban professionals and young families have begun to make their home there. As a consequence, any church placed on the site has a golden opportunity to evangelize. Old St. Mary's is a standard example of the typical contemporary quasi-Corbusian parish church. While possessing some figural sculpture, it is unabashedly modern, if one defines modern as doing pretty much the same thing as everyone else has done for the past fifty years. Seating is fan-shaped and slightly sloped, and the Eucharist is reserved in a glass cubicle which opens into the church and to a large narthex/gatherine area where there appeared, quite inexplicably, to be a wetbar of some sort. The complex has an unremarkable skyline, low to the ground in an area where dozens of skyscrapers will rise in the next decade. In all fairness, the complex has some redeeming features, like a courtyard which is surprisingly quiet despite the high traffic noise out on the pavement. In general, the project attempts to hold some portion of the street frontage, if perhaps in a somewhat uninspiring manner, with the exception of the unsightly parking-lot next door. Our mission was to design a church for the site which would fit into the urban environment and also provide a true experience of the Domus Dei to a thriving neighborhood. We were encouraged to read The Spirit of the Liturgy by the then-Cardinal Ratzinger and to study numerous ancient prototypes of church architecture, stressing the issues of symbolic eastward orientation, iconography, liturgical considerations and also the importance of popular piety in a parish environment. If we wished, we could invite a new religious order in or even have a different rite of we liked. Each one of us were to design a different solution to the problem, same site and roughly the same programatic requirements. I chose to establish an Anglican Use parish in Chicago for the Catholic Pastoral Provision because of the increasing likelyhood of various breakaway Anglican groups joining with Rome in the near future. English Catholicism, and the Anglican Use in the United States, has long been associated with Gothic architecture. With the exception of the Brompton Oratory and some of the more extreme members of the high-church wing in Anglicanism, there have been few attempts to introduce continental Baroque into England and English-speaking culture. However, in light that I had the opportunity to work under the tutelage of an enthusiast of the Baroque, Professor Thomas Gordon Smith, and considered myself more competent in that style, I decided to take up the project of starting with the uniquely English Baroque idiom of Sir Christopher Wren and re-imagining it as a Catholic style. In my research, I discovered England's church architecture and continental Baroque had intersected several times before. The (sometimes quirky) high-church revival of James I and Charles I had used baroque for their choir-screens and altarpieces almost as much as Christopher Wren's preaching-hall City Churches. Some Catholics, come the restoration of the hierarchy in 1840, had argued for following Tridentine models rather than the Sarum Gothic of Pugin and his followers. I learned more about the "Back to Baroque" movement in the Church of England, which I had already known a little about already. While ridiculed in many of the works I had read, I discovered others had more sympathetic views of this exotic ecclesiastical outlier and its most prominent designer, the talented (though agnostic) church furnisher Martin Travers. I found some beauty, and I found some kitsch, and I separated the wheat from the chaff. While there was room in the world for both Gothic and baroque, I decided to go for Baroque in this context. Our Lady, Queen of the English Martyrs would be in the grand tradition of the immigrant parishes of St. John Cantius and St. Mary of the Angels, examples of a mingled European-Midwestern architectural heritage largely unknown in the city churches of Gothic New York and elsewhere. But I thought it essential to make it a distinctly English expression of Catholic Baroque. This had been done before in Chicago, too, when the great builder Cardinal Mundelein had adapted New England Georgian architecture--distinctly American--to the Catholic liturgy at the seminary that now bears his name. Wren would help, and so would Travers--though it struck me the best way to go about was to imagine what their work would have looked like had they themselves been Catholic. How would English craftsmen have adapted Baroque to their rood-beams and altarpieces, their choirstalls and organ-cases? The result would be a unique mingling of English and Italian forms, showing both the parish's unique Anglican identity and also its loyalty to Rome. The project was, in part, an attempt to prove the relevance and compatibility of Catholicism's Roman heritage to reunited Anglican custom--and to English-speaking American Catholicism in general. Churches are almost inevitably overshadowed by city skyscrapers these days. While not a high-rise neighborhood, South Michigan Avenue was well on its way to becoming one. Any church placed there had to stand up proud and straight and be recognizable against the titans that surrounded it. I considered Sant' Agnese in Rome, which occupies a similarly awkward block, hemmed in on two sides by palaces and shops, the lofty tower-churches of Guarini, and also the strange American tradition of the skyscraper church that one finds represented in the Methodist Temple in Chicago and Riverside Church in New York. While the idea of filling up the belfry with office space was unthinkable, the idea of height--of domes and spires, and big blocky ones at that, appeared crucial to me. A lofty dome and spire presented itself as the solution. But like the centralized Sant' Agnese, the dome had to be close to the street in order to be read as part of the facade. Hence, I decided a cruciform Greek cross plan which would give the dome the appropriate prominence as an urban landmark. This would also ensure greater readability in the church's volumes and allow monumentality and a properly liturgical, deep chancel in a site where the length of the church nave was greatly constrained by the shallow depth of the site. Following English custom, I placed an antiphonal choir between the crossing and the high altar, placed against a reredos as customary in the Anglican Use. The choir allowed a certain sacred distance to be placed between congregation and celebrant and making up for the lack of procession possible in a centralized plan. A rood-beam (the only Baroque one I know of ever to be proposed) marks the dividing line between chancel and nave. Seating for 450-500 was possible in the nave and transepts, though the deep chancel did not allow sidelines as perfect as I would have preferred. Side-altars, shrines and two confessionals adorned the transepts and aisles, ample enough also for the traditional singing of the Litany in Procession before high Mass. An elaborate chronological iconographic program was proposed. Beginning in the narthex and baptistery, early English saints and martyrs were depicted, showing the country's early fealty to the faith, while over the confessionals were placed statues of SS. Gregory and Augustine of Canterbury, showing the ties between Roman authority, the power to bind and loose, and the missionary beginnings of English Catholicism. The transept altar of the Lord's Death, with images derived from medieval devotional images of the Mass of St. Gregory, was also adorned with depictions of the martyrs of the Henrican and Elizabethan persecutions. Over the high altar was an image of the Virgin in martyrial scarlet and royal gold, holding the Christ Child who bears the nails and thorns of His own death, linking the sacrifice of Calvary with the martyrdoms of Thomas More and John Fisher, whose figures stand on either side of the altarpiece. The theme of sacrifice is continued by the Throne of Grace Trinity at the top of the reredos. The altarpiece, as the site of the Eucharist, also symbolically represents the reunion of the Anglican Use with Rome, and the papal keys are shown on a bracket holding up the crucified Christ. The insignias of the archdiocese of Chicago and the Pastoral provision are depicted on the predella. The themes of reunion and of Marian devotion continue in the Lady Chapel, dedicated to Our Lady of Walsingham--the greatest shrine of pre-Reformation England and today focus of English Catholic devotion and ecumenism, and the female martyr Margaret Clitheroe. The Lady Chapel was designed to serve also as a daily Mass and Adoration chapel with three confessionals and access from an outdoor parking-lot when the remainder of the church is locked. A covered from one of the transepts to the Parish Hall and the school above allow access in winter, while parents can drop off their kids at the front lobby safely under the eye of the front desk secretary. While not included in the final presentation due to time constraints, the 5-story school block is able to serve K-8 (2 classes of 30 per grade), and has a rooftop playground, underground gym, library and cafeteria. On the ground floor are housed the parish offices. On the right side of the church is the smaller Rectory block with room for several clergy and guest apartments and common rooms, as well as a small office for housekeeping staff. A proposal to include two large apartments for married convert Anglican clergy was scrapped due to the impracticality of such an option. Our Lady, Queen of the English Martyrs is, by its nature, something of a fantasy project and its budget would be beyond the scope of a normal parish. The Greek cross plan is, in the end, more suited to oratories than parishes, and I would in retrospect have preferred more seating. This is, however, a very appropriate project to explore in an acacemic environment. Someone has to begin to push the envelope if we are to revive the craft traditions that modernism has almost completely stamped out. Such a paper project allows the exploration of important design issues, such as the question of how to handle a city church in today's environment. If faced with a real project, I might have handled it somewhat differently, but many of the lessons I have learned as a consequence of this design would nontheless be of great merit to me. It has been an immensely enjoyable semester, and I consider myself lucky to have been able to undertake such a project to the glory of God and His Church, for the promotion of reunion and ecumenism, to learn from my mistakes, and for the opportunity to sharpen my own skills a little bit more. Many thanks to all who helped me along in this exercise: to Professor Smith, my studio critic; to Michael Djorjevitch, Joel Pidel and Matt Enquist for architectural critiques and moral support; to my parents for input on my presentation and for being there; to the Shrine's Emily for helping me sort out the nitty-gritty of the acoustics, the school, and the parish offices; to Lucy of Lux Fidelis for additional help with the parish plant layout and for being a good studio buddy; the Shrine's Dan for dropping in for Lucy's and my reviews; and to Jane of Catholics, Musicians, Students, for helping me out with the particulars of how to lay out a workable antiphonal choir. This past summer many of us had the wonderful opportunity to follow the Juventutem group go and bring the classical Roman liturgy to World Youth Day. Such a venture need not have the presence of an indult, or a reform of the reform parish -- but it certainly could serve as a catalyst to this. I'm not certain if anyone from Juventutem is reading this, but has there been any thought to expanding the Juventutem initiative into an ongoing, localized Catholic young adults initiative, focused on creating young adults passionate about the sacred liturgy, and passionate apologists for the Catholic Faith? Author Denis R. McNamara and photographer James Morris have created a visually stunning and carefully researched book that encompasses some of the most significant Catholic churches of Chicago, addressing both their architectural and theological significance. Color photographs beautifully illustrate the insightful text. It is a book suitable for those interested in local history, architectural achievement, theological awareness, or those who simply desire to glory in the visual beauty of Chicago's historic churches. Has broad appeal for pilgrims, architects, and historians, both casual observers and serious students. Heavenly City is available through the publisher, Liturgy Training Publications, at 800-933-1800 or www.ltp.org. You may also buy a copy at local bookstores. For a list of stores, visit www.ltp.org. Author Denis R. McNamara, an architectural historian who specializes in American church architecture of the 19th and 20th centuries, holds a Ph.D. from the University of Virginia. He has written and lectured widely on the history and theology of ecclesiastical architecture, and had served on the Art and Architecture Commission of the Archdiocese of Chicago. He is currently Assistant Director and faculty member at the Liturgical Institute of the University of St. Mary of the Lake/Mundelein Seminary, and serves as a liturgical design consultant. Photographer James Morris specializes in architectural and cultural subjects from around the world, working with publishers, magazines and architects, including his recent book published in 2000, Churches of London (Contemporary Books). In 2004 he published the monograph Butabu: Adobe Architecture of West Africa, of which The New York Times commented, "The British photographer James Morris easily takes the palm for the year's most haunting architectural images." His work is exhibited in both Europe and the United States and has been awarded prizes by, among others, Chicago's Graham Foundation for Advanced Studies in the Fine Arts, and the United Kingdom's Design and Art Directors Guild. He currently lives in Wales. Steven Schloeder's website pointed me toward a liturgical and ecclesiastical design firm worthy of the name. Murals by Jericho have some incredible work up for display on their website. Great for a parish looking to truly "spruce up the place" but inspiring as well for the rest of us to see that sacred art is still alive and well. TCRnews.com has re-printed an interesting piece from "This Rock" magazine by Dr. Marcellino D'Ambrosio. Dr. D'Ambrosio brings up a number of the liturgical good fruits of the Council, such as the expansion of the liturgical readings to include many from the Old Testament, etc. I think some of the points he raises are worth charitable and informed debate, though perhaps as a matter of particularities rather than general principles -- for example, how active participation is currently manifested, how the liturgical calendar was revised, or the question of silent prayers by the priest. Overall a good piece which can be a reminder of much that was good. If there is anything that Catholics in the pew know about Vatican II, it’s that “Vatican II changed the Mass.” But when asked to enumerate those changes, most mention the disappearance of Latin and the priest facing the people and not much more. Interestingly enough, neither of these effects were mandated by the actual text of the council’s Constitution on the Sacred Liturgy Sacrosanctum Concilium (SC). But many other things were. First of all, the issue at hand was not only the Mass but the entire liturgy which includes all the public, official prayers of the Church. The Council wanted to renew every aspect of liturgical life–the Mass, all the sacraments, the divine office, the Roman Calendar, and the sacramentals or blessings of the Church as contained in the Roman Ritual. Without in any way wanting to discourage the life of devotional prayer that characterized Catholic piety (rosary, novenas, the stations of the Cross, etc), it wanted to assert the superiority of liturgical prayer over all other activities and once again make the entire liturgy the source and summit of Christian life (SC 7-10). It wanted to restore a greater communal meaning and experience to all liturgical celebrations and encourage the active, conscious participation of the laity in them as well. This active participation, in fact, was the aim to be considered before all else in the revisions the council mandated for all dimensions of the liturgy (SC 34). The actual revision of liturgical books was a task that went beyond what the council could achieve in its four short years. So a post-conciliar commission was appointed, known as “the Concilium,” that carried out the revisions, with final texts requiring the approval of the Roman Pontiff prior to promulgation. There is much controversy among loyal Catholics about the translations of texts and the way in which changes were implemented. To address these issues would go beyond the scope of this article. But undoubtedly there have been many wonderful achievements that are often today simply taken for granted. The first to note would be the revised lectionary (SC 35). Prior to the Council, there was very little of the Old Testament ever read in the Mass of the Roman rite. In the new lectionary, in contrast, we have an Old Testament reading in every Sunday Mass which is carefully coordinated with the gospel in such a way that they illumine each other. They, together with the psalm and epistle, are arranged in a three year cycle so that Sunday Mass-goers hear the highlights of the entire Bible over three years. A similar cycle of daily readings helps daily communicants able to review the most salient passages of the entire Bible in two years. The council’s desire that the people of God be exposed to a much richer diet of God’s word in the liturgy has been accomplished. In a similar way, the liturgy of the hours (SC 83-101) went from a one week to a four week cycle of psalms. The antiphons and readings for the seasons of the year and saints days give all who participate a profound access to the Catholic tradition. The Office of Readings is filled with substantial biblical passages with accompanying selections from the Fathers, Doctors, and councils that dovetail both with the biblical reading and the Feast or liturgical season being celebrated. A few other solid liturgical achievements should also be briefly noted: 1) the restoration of concelebration (SC 57) and a greater sense of the liturgy as a communal rather than just a personal act; 2) a revision of the calendar that keeps our focus more on the paschal mystery and the seasons than on saints’ memorials; 3) the revised rite of blessings or sacramentals (SC 79) that powerfully brings the liturgy into daily, secular life with rites that in many cases laity can lead; 4) the restoration of the Eucharistic prayer to an audible prayer (it used to be whispered and called “the Secret”) standing at the center of the celebration and the introduction of several Eucharistic prayers in addition to our beloved Roman Canon. Yet there is much left to do. The principle underlying the revision of the Roman Rite was supposed to be “noble simplicity”(SC 34). Many seem to have interpreted this to mean “casual simplicity.” The Fathers of the Council had no intention to encourage lack of reverence or a lessening of a sense of awe and amazement by making the liturgy more accessible and understandable. Yet it is hard not to notice a ho-hum attitude on the part of many clergy and laity which is discernable through word, posture, dress, and facial expression when participating in the official worship of the Church. The criterion that was to be highest of all in carrying out liturgical reform was “the full, conscious, and active participation” of the laity in the liturgy (SC 14). In fact, the phrase “active participation” occurs 15 times and can be said to be the refrain of the council’s Constitution of the Sacred Liturgy. We see much more outward participation now than we did prior to the council–lay lectors, ushers, even extraordinary ministers of the Eucharist, offertory processions, musicians, etc. Yet this more extensive outward participation had as its aim encouraging a more intensely inward, spiritual engagement in the liturgy. Speaking of the laity’s participation in the Mass, the Council says: "Offering the immaculate victim, not only through the hands of the priest but also together with him, they should learn to offer themselves." (SC 48). The council mandated changes in the sacramentals and the liturgy of the hours in part so that they could be fruitfully and regularly used by the faithful to sanctify every dimension of life and every hour of the day. Yet few laity even know of the existence of the revised “Book of Blessings” or have any idea how to participate in the liturgy of the hours. This ultimate goal of the council’s liturgical reform–the inner, life-changing participation of the faithful in every aspect of liturgical life-- is still far off on the horizon. The next great frontier to conquer over the next several decades must be the spiritual appropriation of the liturgical teaching of the council. It is one thing to rewrite texts. It is quite another to transform hearts. But if we fail to press on to the level of the mind, heart and daily life, we will have betrayed the true intent of the council fathers and of the Holy Spirit himself. Clearly, evangelization, catechesis, and spiritual renewal of clergy and laity alike will be required to move beyond reform of rites to renewal of lives. [This was recently posted on the Second Spring forum, a web forum associated with the Second Spring Journal listed on this weblog, by Stratford Caldecott. I post it by way of information and interest. On 6th July 1971 The Times published the text of an appeal to preserve the Roman Catholic Mass in its traditional form, which had been sent from Britain to the Vatican. Similar appeals, ecumenical and non-political, were allegedly made from other countries. “If some senseless decree were to order the total or partial destruction of basilicas or cathedrals, then obviously it would be the educated - whatever their personal beliefs - who would rise up in horror to oppose such a possibility. Now the fact is that basilicas and cathedrals were built so as to celebrate a rite which, until a few months ago, constituted a living tradition. We are referring to the Roman Catholic Mass. Yet, according to the latest information in Rome, there is a plan to obliterate that Mass by the end of the current year. “One of the axioms of contemporary publicity, religious as well as secular, is that modern man in general, and intellectuals in particular, have become intolerant of all forms of tradition and are anxious to suppress them and put something else in their place. But, like many other affirmations of our publicity machines, this axiom is false. Today, as in times gone by, educated people are in the vanguard where recognition of the value of tradition in concerned, and are the first to raise the alarm when it is threatened. We are not at this moment considering the religious or spiritual experience of millions of individuals. The rite in question, in its magnificent Latin text, has also inspired a host of priceless achievements in the arts - not only mystical works, but works by poets, philosophers, musicians, architects, painters and sculptors in all countries and epochs. Thus, it belongs to universal culture as well as to churchmen and formal Christians. Signed: Harold Acton, Vladimir Ashkenazy, John Bayler, Lennox Berkeley, Maurice Bowra, Agatha Christie, Kenneth Clark, Nevill Coghill, Cyril Connolly, Colin Davis, Hugh Delargy, +Robert Exeter, Miles Fitzalan-Howard, Constantine Fitzgibbon, William Glock, Magdalen Goffin, Robert Graves, Graham Greene, Ian Greenless, Joseph Grimond, Harman Grisewood, Colin Hardie, Rupert Hart-Davis, Barbara Hepworth, Auberon Herbert, John Jolliffe, David Jones, Osbert Lancaster, F.R. Leavis, Cecil Day Lewis, Compton Mackenzie, George Malcolm, Max Mallowan, Alfred Marnau, Yehudi Menuhin, Nancy Mitford, Raymond Mortimer, Malcolm Muggeridge, Iris Murdoch, John Murray, Sean O'Faolain, E.J. Oliver, Oxford and Asquith, William Plomer, Kathleen Raine, William Rees-Mogg, Ralph Richardson, +John Ripon, Charles Russell, Rivers Scott, Joan Sutherland, Philip Toynbee, Martin Turnell, Bernard Wall, Patrick Wall, E.I Watkin, R.C. Zaehner. VATICAN CITY, DEC. 11, 2005 (Zenit.org).- Benedict XVI has appointed Sri Lankan Archbishop Albert Malcolm Ranjith Patabendige Don as the new secretary of the Congregation for Divine Worship and the Sacraments. The 58-year-old prelate has been apostolic nuncio in Indonesia and East Timor. Born in Polgahawela, in what was then called Ceylon, he was ordained a priest in June 1975. He was appointed auxiliary bishop of Colombo, the country's capital, in June 1991. Four years later, in November 1995, he was appointed bishop of Ratnapura. In October 2001, Pope John Paul II called him to Rome to be an official of the Congregation for the Evangelization of Peoples. In April 2004 he was appointed apostolic nuncio in Indonesia and East Timor, being raised to the rank of archbishop. Archbishop Patabendige Don is replacing Archbishop Domenico Sorrentino as secretary of the Congregation for Divine Worship. The latter was appointed by Benedict XVI on Nov. 19 as archbishop of Assisi-Nocera. The Congregation for Divine Worship is headed by Cardinal Francis Arinze. I'd like to take this opportunity to let the blog readership know that I've welcomed another individual who will make a nice addition to this blog: Steven Schloeder. Some of you may recognize Steven as the author of Architecture in Communion: Implementing the Second Vatican Council through Liturgy and Architecture published by Ignatius Press. Steven is a church architect and runs his own firm, Liturgical Environs. Steven and I have had the pleasure of communicating off and on for the past number of years and I am pleased to have him on board. I am sure we all look forward to hearing from Steven whenever he gets the time between his architectural projects to post to the weblog! [This particular topic is related quite closely to the story re: Vatican II. This story pertains to one reported on this weblog earlier, regarding a proposed renovation of an Irish Cathedral designed by one of the Pugin family -- which is, consequently, of historical and ecclesiastical importance. The proposed renovation drawings are included, and while one can see they aren't the worst renovation plans (excepting the way the cathedra and presider's chair are handled in the drawing), nonetheless, the question arises as to why this is deemed truly necessary? Further, ought not the historical importance be a significant factor to tip the scales against even any renovation plan, even if it be decent, if it would harm architectural features that make the building important and a cultural and ecclesiastical treasure? Benedict XVI Is to Reinterpret the Second Vatican Council? ROMA, December 5 2005 – Benedict XVI’s homily during the December 8th mass in Saint Peter’s, exactly forty years after the end of the Second Vatican Council, is eagerly awaited. There are conflicting interpretations within the Church of this event and its consequences. One wide-spread idea is that Vatican II marked a “new beginning” in Church history, and that thanks to it – its “spirit” more than the words of its actual texts – the dogmas, laws, structures and traditions of the Church entered a phase of permanent reform. However, Joseph Ratzinger has shown on a number of occasions that he does not share this reading of the facts. And so has – amongst others – his cardinal vicar for the diocese of Rome, Camillo Ruini. Only last June Ruini declared: “It is time for history to produce a new reconstruction of Vatican II – one that finally tells a true story”. The target of the cardinal’s criticisms was the account of Vatican II produced by the “Bologna school” with the help of an international team. This version was translated into a number of languages and was widely read on all continents, but was judged by Ruini and Ratzinger himself to be “extremely weak and lacking any real consensus in the body of the church”. However, it is not expected that Benedict XVI’s homily on December 8th will address the issue from a historic point-of-view. This perspective was already covered several days ago in a short but dense writ by the president of the Pontifical Committee for Historic Sciences, the current pope’s fellow countryman monsignor Walter Brandmüller. Published in the November 29th issue of the Italian bishops’ conference’s daily newspaper “Avvenire”, Brandmüller’s article underlines the “totally unprecedented” elements which distinguish Vatican II from other Councils coming before it. He highlights the “very different level of obligation” of its documents, and its “fear of passing doctrinal condemnations and dogmatic definitions”. He explains how a schism like that of Lefebvre could have stemmed from the Council, and why some people called for a new Council only shortly after this one’s conclusion. But more than this, Brandmüller demonstrates the lack of historic – as well as theological – justification in interpreting Vatican II as – in the worlds of Ratzinger – “a totally new beginning, as though this were the superdogma that makes everything else irrelevant”. In addition to being president of the pontifical Committee for Historic Sciences since 1998, and professor emeritus of the University of Augsburg, Brandmüller is also the editor of “Annuarium Historiae Conciliorum”, the most influential international scientific magazine on the history of Councils, which he founded in 1969 with Remigius Bäumer, and runs the publishing group “Konziliengeschichte”. Below is his article as it appeared in “Avvenire” on November 29th 2005. It is the perfect preface to what Benedict XVI will say in his homily on December 8th. 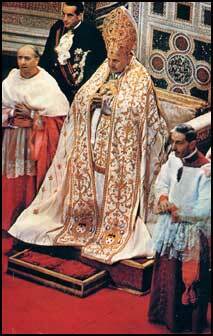 The II Vatican Council (1962-1965) was the Council of superlatives. Never before in the history of the Church had a Council been prepared with such intensity. Of course, Vatican I (1868-1870) was well-prepared, and the theological quality of its plans was actually better. But the number of proposals and inputs sent in from around the world, and their incorporation in Vatican II, exceeded anything previously seen. Vatican II gave visible proof of being the Council of superlatives even simply with the enormous number of 2,440 bishops who entered Saint Peter’s basilica. While Vatican I, with its 642 fathers, had found room in the right transept of the basilica, this time the Council’s meeting hall was the entire central nave. In less than one century, the Church had become truly global. Never before had it happened, as it did in 1962, that one thousand journalists from all over the world had registered for the Council. Thus Vatican II also became the best-known Council of all times, becoming a first-rate global media event. Finally, of the 1,135 pages which cover the decrees of all twenty ecumenical Councils, Vatican II in itself takes up 315, well over one quarter. Other distinguishing attributes of this Council are less obvious. Councils fulfill supreme magisterial, legislative and judicial functions “under and with the pope”, who holds these duties even without the Council. However, not all Councils exercise all of these powers. While the first Council of Lyons (1245) formulated laws and acted as a court, with the excommunication and deposition of emperor Frederick II, Vatican I did not pronounce judgments or codify laws, instead concentrating exclusively on issues of doctrine. The Council of Vienne (1311-1312), on the other hand, judged, passed laws and made decisions of faith issues, as did the 15th-century Councils. By contrast, Vatican II did not pass sentences, nor pass laws, nor did it deliberate in any definite way on questions of faith. It really became a new type of Council – a “pastoral” Council with the purpose of bringing the Bible and the modern world closer together. Specifically, it did not express doctrinal condemnations, as John XXIII emphasized in his opening speech: “The Church has always opposed heresy, and has often condemned it very harshly,” while this time “the Church prefers to make use of the healing powers of pardon,” because “it believes this to be better suited to the needs of this era, and because it prefers to show the validity of its doctrines rather than expressing condemnation.” Nevertheless, with historic hindsight it is clear that Vatican II would have been wiser to follow the lead of Pius XII, finding the courage to expressly condemn communism. The fear to pronounce doctrinal condemnations and dogmatic definitions actually led to wide contradictions amongst the texts produced in the Council. Thus the dogmatic constitution “Lumen Gentium” on the Church and “Dei Verbum” on divine revelations have all the characteristics and style of doctrinal documents, but without any concrete definitions. And according to the canon law expert Klaus Mörsdorf, the declaration “Dignitis Humanae” on religious freedom “takes a position without having a clear legal standpoint”. The documents of Vatican II therefore have a very different level of obligation, and this too is a new feature in Council history. Comparing II Vatican Council with the first Council of Nicaea (325), the Council of Trent (1545-1563) and Vatican I, and bearing in mind their respective consequences, it becomes clear that a schism took place after both Vatican Councils. First, in 1871, there were the “old Catholics” protesting against the definitions of the primacy and the infallibility of the pope; then in 1988 there were Archbishop Lefebvre and his supporters. As ideologically opposed as these two movements appear, they both represent the rejection of legitimate developments in the doctrine and life of the Church – a rejection based on a distorted relationship with history. After the Nicaean Council began religious battles that were to grow in bitterness and violence for over a century until the Nicaean doctrine was imposed at the Council of Chalcedon (451). This comparison can also be drawn with the Council of Trent, which produced an extraordinary growth spurt in the missionary, religious and cultural life of those parts of Europe that had remained Catholic – the “miracle of Trent” of which Hubert Jedin spoke. This growth did not come suddenly, however: after the Council ended, more than a century passed before its dogmatic and reforming decrees would show results on a significant scale. Practically every Council, including Vatican II, has unique elements in its structure, development and content; what they all have in common is the collegial wielding of supreme doctrinal and pastoral authority. From the content perspective it is the presentation, interpretation and application of traditions to which each Council makes its specific contribution. This obviously does not mean an addition of new content to the faith of the Church, nor an elimination of doctrine that until that point was fundamental. Rather, it s a process of development, clarification and distinction, which takes place with the help of the Holy Spirit. Through this process every Council with its definitive doctrinal announcement takes its place as an integral part of the greater tradition of the Church. This is why Councils always look forwards, to a doctrinal announcement that is wider, clearer and more in touch with the times, and never backwards. A Council cannot contradict its predecessors; it can only integrate, clarify and move forwards. The situation is different when the Council is a legislative organ: legislation can and must always fit into the concrete needs of a given historical situation, and so – always within the framework set by the faith, it is subject to change. All of this also applies to Vatican II. It is no more or less than a Council amongst many others, next to and after others, not above or beyond them but within the series of general Councils of the Church. This is based on the concept that at the heart of the Counciliar institution is the essence of tradition. This genuinely Catholic concept is reflected in this definition from the II Nicaean Council (787): “Since this is the way things are, we have in a certain way chosen the higher road and followed the doctrines of our fathers, inspired by God and the traditions of the Catholic Church, which as we know has its origins in the Holy Spirit which lives within it”. The last of this Council’s four condemnations is particularly important: “Anyone who rejects the entire ecclesiastic tradition, be it written or not, shall be excommunicated”. Vatican II is no different in recognizing its place within the foundations of tradition. The number of references to tradition in Vatican II texts is noteworthy. The Council widely embraced tradition, quoting previous Councils and especially the Council of Florence (1439-1442), Trent and Vatican I, the encyclicals of numerous popes, the Church Fathers and great theologians, first and foremost Thomas Aquinas. “Some descriptions give the impression that everything was different after Vatican II, and that nothing that came before it could still be considered relevant, or could be relevant only in the light of Vatican II. Vatican II is not treated as a part of the greater living tradition of the Church, but as a totally new beginning. Even though it did not issue a single dogma and wanted to be considered a humble pastoral Council, some recount it as though it had been a kind of superdogma which makes everything else irrelevant”. But “we can render Vatican II worthy of more faith if we call it what it was: a part of the single and whole tradition of the Church and its faith”. In the years after the Council it was en vogue to compare the Church to a building site on which there were demolitions, new constructions and reconstructions. Very often in sermons, God’s order to Abraham to leave his country was interpreted as an exhortation to the Church to abandon its past and traditions. On the contrary: it must be clearly stated that trying to interpret II Vatican Council outside of tradition would go against the essence of faith. It is tradition, not the spirit of the times, which defines the scope of its interpretation. Of course the situation of the times must be considered – there are current problems which need answers. But these can only come from divine revelation, through the Church. This tradition represents the criterion against which any new answer must be conformed, if it is to be true and valid. Against this backdrop, the fashionable distinction between “pre-Vatican II” and “post-Vatican II” is of dubitable theological and historic basis. A Council is never a point of origin or destination against which the history of the Church or salvation can be measured. A Council is a link in a chain, the end of which no one knows except the Lord of the Church and of history. A Council can never break the continuity in the actions of the Spirit. Continuity implies continuation. So will there be a Vatican III? It comes as no surprise that a request for this has been put forward – actually from opposing sides. Some believe that a new Council should meet to finally carry out the democratization of the Church, allowing those who after a failed marriage find a new partner access to the sacraments, opening the door to marriage for priests and female clergy, and bringing about the reunification of divided Christians. Others think that the confusion and crises of the tumultuous post-Vatican II period necessitate urgently a Vatican II to reestablish order and provide guidance. One thing is certain: this possible new Council – perhaps in Nairobi or Moscow, Nairobean or Muscovite – would find its place within the framework of tradition and would be just one part in this venerable series. Vatican II was neither the beginning nor the end of Council history, and we have to grasp this before we can speak of the future.